When you’re in a real hurry or just too tired to cook anything too elaborate, here’s a great solution: cacio e pepe, literally ‘cheese and pepper’, a pasta dish usually made with spaghetti, bucatini or—my personal favorite—tonnarelli, a kind of square spaghetti better known Stateside by its Abruzzese name, spaghetti alla chitarra. This old-time Roman dish has become fashionable lately, and you’ll find it on the menus of the priciest Italian restaurants. But don’t let that turn you off—there’s actually nothing pretentious at all about cacio e pepe. 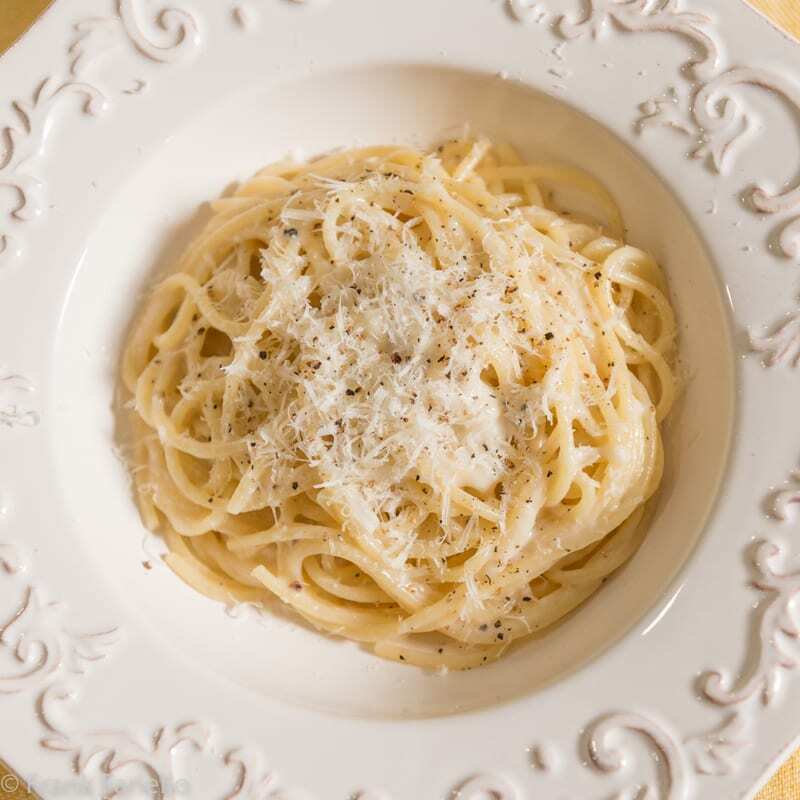 Great for a weeknight dinner or spur of the moment spaghettata, to make cacio e pepe you simply toss just-boiled pasta with lots of grated pecorino romano and freshly ground black pepper. With only three ingredients—four, if you count the pinch of salt for the pasta water—nothing could be more quintessentially Italian in its exquisite simplicity. And yet cacio e pepe is not that easy to master. Get your technique wrong, and this dish can turn into a rather unattractive mess. But no worries, let me give you a few tips that will have you whipping up your own perfect cacio e pepe in no time. Serve on heated plates, topped f you want with more grated pecorino and another healthy grinding of pepper. Your mixing technique is the key to success. The most important thing to remember for a successful cacio e pepe is not to stop mixing too soon. At first, the cheese will tend to clump together, but don’t be discouraged. Keep on mixing vigorously, adding a bit of cooking water if you need to so that the pasta slithers around freely, until the cheese melts entirely and clings uniformly to the pasta. If the pasta is too wet for the cheese to cling to the pasta, add more grated cheese. On the other hand, you shouldn’t take too long either, as the pasta will be cooling off the whole time. If you take too long, the cheese will begin to harden and your pasta will start to get cold. So be energetic in your stirring. I find that tongs are perfect for this job, but the traditional pasta fork will do you just fine. Getting this mixing business right is a bit tricky at first, but it will come with a bit of practice. If you find this all a little intimidating, a practically foolproof if not entirely DOC technique is to melt a bit of butter with a ladleful of the cooking water in a skillet, to which you add your pasta and then your cheese and pepper. You sauté the whole thing over very gentle heat until it all comes together. This keeps the pasta nice and warm, and you can take your time mixing. There are some variant techniques for making cacio e pepe. Some recipes call for you to mix the grated cheese and ground pepper in the bowl before adding the pasta on top. In my experience, this leads to too much of the melted cheese sticking to the bottom of the bowl rather than the pasta. (Some sticking is inevitable—feel free to scrape up the melted cheese with a spatula and top your pasta with it.) Some recipes also tell you to add a bit of butter or un filo d’olio before or after you mix the pasta. I rather like the creaminess of the butter variation, but I like even better the austere (but very tasty) simplicity of just pasta, cheese and pepper. And finally, some people mix pecorino with the milder parmigiano-reggiano. To me, however wonderful parmigiano is, the salty ‘bite’ of pecorino is one of the attractions of the dish, so I wouldn’t dilute it with anything else. But, as they say, de gustibus non est disputandum. If you like the idea of any of these variations on cacio e pepe, by all means try them and let us know how you like them! Your mixing technique is the key to success. The most important thing to remember for a successful cacio e pepe is not to stop mixing too soon. At first, the cheese will tend to clump together, but don't be discouraged. Keep on mixing vigorously, adding a bit of cooking water if you need to so that the pasta slithers around freely, until the cheese melts entirely and clings uniformly to the pasta. If, on the other hand, the pasta is too wet for the cheese to cling to the pasta, add more grated cheese. On the other hand, you shouldn't take too long either, as the pasta will be cooling off the whole time. If you take too long, the cheese will begin to harden and your pasta will start to get cold. So be energetic in your stirring. I find that tongs are perfect for this job, but the traditional pasta fork will do you just fine. Getting this mixing business right is a bit tricky at first, but it will come with a bit of practice. Tonnarelli & Pecorino – always. As expected, you instructions for this preparation are impeccable Frank, thank you. I love this recipe and sometimes the most simple dishes pack some of the best flavor! Such a terrific dish! I’ll bet this is the pasta dish we make most often. I often use some warmed olive oil in this dish, mainly because we like its flavor. Really good, but not authentic, And I always reserve a little bit of the cooking water in case I have problems with the cheese not melting correctly — adding a little water always seems to do the trick. Good stuff — thanks. Sounds delicious. I have to try it, especially since you have provided such helpful hints. My first attempt earlier this year at Cacio e Pepe was a colossal failure. Thanks to your suggestions, I made it last night and it came out just as it should! Thanks! Next goal will be Crocchette di patate! Great to hear it, Jim. Glad I could help. Love your blog, have used quite a lot of your recipes and they are always amazing! I want to try this but cannot get my hands on pecorino. Could you substitute it for parmesan? Or another type of cheese? Hmmm… Pecorino is such a distinctive cheese, with a very different flavor from Parmesan. What you would be looking for is a fairly sharp cheese that melts well. There are actually not too many, as most melting cheeses are also fairly mild. Having said that, Parmesan or Asiago would make for a very nice dish, too. Tossing pasta with Parmesan and butter is one of the most common spur of the moment pastas. And adding freshly ground black pepper in the manner of cacio e pepe would give a nice kick. After returning last week from a heavenly food journey in Compagna, I discovered (and signed onto) your blog while looking for a recipe for colatura di alici, and found numerous crossovers with my own experiences in others of your recipes. For example, I worked hard to recreate the deceptively simple recipe tonnarelli cacio e pepe after first having it at the wonderful restaurant Felice in Rome’s Testaccio district. I thought I’d pass along one of the “secrets” to this dish that they revealed to me: the pepper should be very very finely ground. It makes a difference. Unfortunately, I’ve yet to find dried, let alone fresh, tonnarelli here in Vancouver. Fortunately, there are substitutes. Hi Gareth. I also live in Vancouver and can tell you you will not find fresh tonnarelli here! However, you can find tonnarelli aka chitarra pasta dried. Or…you can buy yourself a chitarra (got mine at Gourmet Warehouse on E. Hastings). For the dried pasta, Gigi is a brand I buy and I find it at Renzulo on Nanaimo. You may also find it at Ugo & Joe on E. Hastings. I’m leaving a link to my website so you can check out the page called “Some of Our Favourite Sources” to see a list of where we like to pick up things. Cacio is a big favourite in our house…but the recipe we use had coarsely ground black pepper…there is no “rule” it seems! Yummy dish regardless! Thanks for your comment and your readership, Gareth! Truly one of my favorite dishes from Rome. Thanks – I think we will have this sometime during the week! Yes, indeed, it’s funny how certain dishes are “discovered”, are all the rage at least for a while, then fade from the public eye. It’s food as fashion… Frankly, I try not to pay too much attention. I loved cacio e pepe long before it was “cool”, and I’ll keep on enjoying it long after it’s been forgotten by “foodies”! Couldn’t agree more with your comments Frank! Amazing how North Americans “discover” something that has been a staple for ever in Italy!!! Don’t worry, they always move on to the lastest, hotest, “new” thing!!! These simple, straightforward dishes are always the best! Thanks for the details. Perfection. One of my favorites. If it weren’t so rich I would eat it at least twice a week. This is my go-to comfort dish and probably more responsible for the pounds on me than any sugary sweet. When it’s cold, when it snows…. when we’re happy…. when we’re not. It is the dish my son asked for his birthday dinner for many years! The instructions are spot on! This is one of my favorites and I love the simplicity of ingredients. However, it can turn into a gloppy mess if you have improper technique (I learned the hard way). Your instructions are a perfect guide to making this classic dish a success. LOVE Cacio e Pepe, but would you believe I never had it until last year? No idea why my Nonna never made it as we are in the region for it. I went to an agriturismo in Picinisco, where Loreto, the cheesemaker, gave me a cooking lesson on how to make proper Cacio e Pepe. He gave all the tips you listed, but an additional one: he said to boil the pasta in less water than usual as you need the starch to help in making the sauce. The post is on my site and I added a video clip of Loreto stirring the pasta! People who don’t enjoy cooking and traveling are beyond my comprehension. I like the tip, Christina! I’ll have to try it that way next time. Ah cacio e pepe! The epitome of less is more. The mark of a *real* Italian restaurant is that they serve it. My favourite place for it in Rome is Alfredo e Ada on Banchi Nuovi. You really do need to have the pasta wet before starting the manticatura. I’ll have to look up Alfredo e Ada next time I’m in town. Thanks for the tip! farli alla perfezione non è semplicissimo ma con le tue istruzioni penso che sarà un successo ! Buon fine settimana Frank ! Grazie, Chiara! Buon fine settimana anche a te. Been looking for a receipe for timbale de verdurae. Can’t remember or find the receipe from my mother-in-law’s collection. She was from Ascoli Piceno, Italy — and made the dish each holiday. She might have gotten the receipe from a friend in Calabria. There are many vegetable timbales in Italian cookery, so it’s hard to say. Do you remember any more about the dish, for example which vegetables she’d include or if it had a crust, etc.? “adding a bit of cooking water if you need” This is the very important trick ! Well done , it’s the real roman recipe, you have my approvation from Rome ! This is perhaps my favorite pasta dish and your instructions are spot on. Such a wonderful post, thank you. Cooks Illustrated suggests cooking one pound of pasta in just two quarts of water, much less than usual, which will increase the pasta’s starchiness, enhancing the adhesiveness for the cheese. Sounds like a good idea—will have to try it next time. Beautiful in its simplicity. I saw the photo on Instagram and couldn’t wait until you posted. What a delicious meal!! We have plenty of bucatini in our pantry — I think they are screaming to be dressed in your sauce. Grazie! Buon fine settimana! Buon fine settimana anche a te, Marisa Franca! Thank you for very detailed and useful instructions. I have been planning for quite some time to make cacio e pepe because I know that simple dishes like this one are really the best ones! Your recipe is spot on! Thanks so much, and enjoy your cacio e pepe! Instead of leaving water on the pasta, drain well and toss with olive oil, then toss with cheese and pepper. This is something that I can eat every day without feeling bored. Thank you for sharing, the tonnarelli looks stunningly creamy and delicious.